Rhonda is a student at the University of Minnesota-Twin Cities that shares some strategies that are successful in college algebra math through her experience as a PAL facilitator. Among her comments concerning competitive learning games in PAL sessions. She carefully uses it in class to energize students before major exams where shes uses a version of Jeoprady with them. Most of the semester she has them work in small groups on work sheets which require teamwork to complete. Jered is a student at the University of Minnesota-Twin Cities that shares some strategies that are successful in college Calculus I math through his experience as a PAL facilitator. Among his comments he shares strategies to engage the students through intentional peer cooperative learning activities. Ahn is a student at the University of Minnesota-Twin Cities that shares some strategies that are successful in college algebra through her experience as a PAL facilitator. Among her comments she shares strategies to engage the students through intentional peer cooperative learning activities such as jigsaw and the need to have students move around the room to different math work stations to energize them, especially with PAL sessions early in the morning. Nikela is a student at the University of Minnesota-Twin Cities that shares some strategies that are successful in college algebra through her experience as a PAL facilitator. Among her comments, she shares on her caution with using gaming activities in her math sessions; activities that involve students with math board work and leading a discussion with the class; reasons for selecting small groups of three students; and reasons for asking students to provide alternative solutions for solving math problems. Melissa is a student at the University of Minnesota-Twin Cities that shares how she serves as a PAL facilitator in an introductory general chemistry course. She shares several strategies for the sessions including exam bingo and involving students with creating the problem worksheets and helping others students to solve them. I am hosting a new audio podcast series available for free subscription through Apple's iTunes store or free downloading through this blog page. 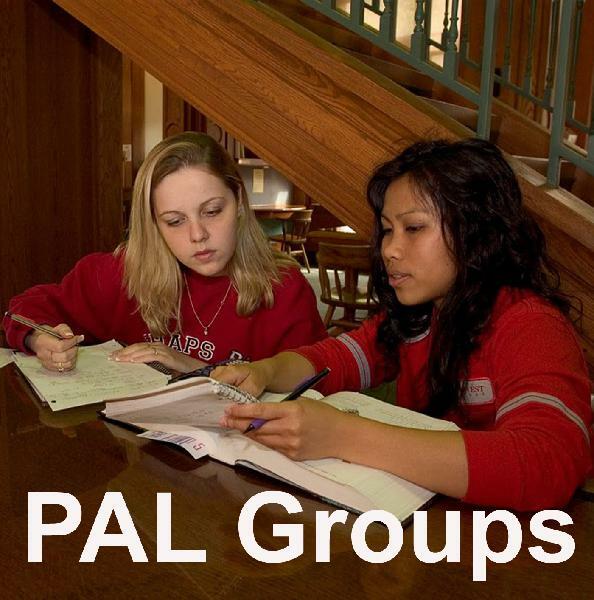 It is called the Peer Assisted Learning (PAL) Groups Podcast. It features short episodes of about 10 minutes devoted to interviews of students that facilitate and guide study review groups with other college students. This blog page is devoted to sharing new things that I am learning about peer assisted learning (PAL). This podcast is a natural extension of that information by sharing the personal stories of the people who actually provide the service, the PAL facilitators themselves. Each episode features several PAL session activities that worked well with the subject matter and the students. The interview ends with the PAL facilitator reflecting on what they are learning personally and professionally about the experience as PAL facilitator. Initially, the interviews will be with PAL facilitators at the University of Minnesota-Twin Cities. Eventually, study group leaders at other colleges will be included. Please email me if you or your student study group leaders would like to be interviewed for the podcast, arendale@umn.edu I was on the team at the University of Minnesota that developed the PAL model to meet the needs of our students in historically-difficult first-year courses.